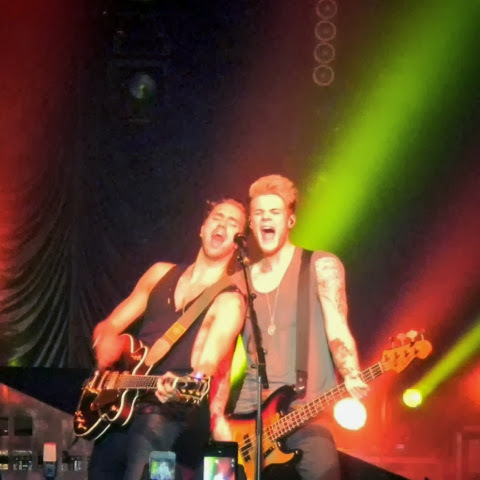 Last night I went up to Birmingham to see Lawson. They comprise of lead singer/guitarist Andy Brown, lead guitarist/backing vocalist Joel Peat, bassist/backing vocalist Ryan Fletcher and drummer Adam Pitts. I've seen them three times now and it's safe to say they are definitely one of my favourite bands to see live. The gig was at the O2 academy which is a really nice venue, and I preferred it to the HMV Institute where I saw them back in March. The first time I saw Lawson was March 2012 when they supported The Wanted on their arena tour and I've loved them ever since basically! There were two support acts, one of which also supported Lawson when they toured earlier this year and who I wasn't a fan of then and I still haven't been one over after seeing them for the second time. However, the first support act to come on I did actually really like. They were a band called Paighton and I was really pleasantly surprised by them. They're a classic pop/country/rock hybrid band of four members, Andy, Joe, Dave and Pete. Their songs were great, my personal favourite being 'Keep it Alive' which I loved and they got the crowd involved with. I've been listening to the few tracks of theirs that are on YouTube all of today and I honestly cannot get enough. And as if their music wasn't good enough, they're easy on the eyes as well. I'm listening to 'Somebody' as I write this. Honestly, they are so underrated. I am still baffled as to how they haven't gotten a number one yet, because the music is flawless and they put so much effort in to it. Some of the most deserving people. The tour is titled the 'Everywhere We Go Tour,' named after one of the songs ('Everywhere You Go') on their debut album 'Chapman Square.' It's one of my favourite of their songs and so I was definitely expecting great things, and they did not disappoint. They opened with their newest single 'Juliet' which is slightly different to the other songs they've released, but in a good way. It got the crowd up and going and in anticipation of what would come next. They played two new songs from their upcoming album, which a kind of extended version of 'Chapman Square' and called 'Chapman Square Chapter II.' The first of these was called 'Love Locked Out' and I absolutely adored it. It's got a retro feel to it which I utterly love and it's just smooth, real music. The other was called 'Parachute.' It didn't disappoint either. It was much more dramatic and seemed a lot more serious in contrast with 'Love Locked Out' but still so good. A song called 'Die For You' is one of my favourites to hear live, mainly for the guitar solo from Joel. It. Is. Insane. They did a little acoustic of a song called 'Stolen' which was beautiful, but they also mixed in a couple of other album tracks to make it a short medley, which I thought was really creative and generally just nice to hear. Towards the end they covered 'This Is What It Feels Like' by Armin van Buuren. It just got the crowd even more involved, and for the people who didn't really know much of Lawson's music it was a good way to get them more interested with a song that's been in the charts recently. The penultimate song was 'Everywhere You Go' which is just beautiful and ballad-like but they can still manage to make it feel like an anthem. And finally, my favourite Lawson song, and the one that hooked me on them to start with: 'Standing in the Dark.' It's just stunning and I feel like it'll be a timeless classic for me. The voices of all the people in the audience singing the lyrics is something I find really magical with this song in particular and I feel like it just has an effect like no other. Overall, the night was completely wonderful. I greatly look forward to the next time I can see them and to the release of their next album. Lawson are a band who really show what talent that works hard can do and I can but wish them the most brilliant of success in the future.